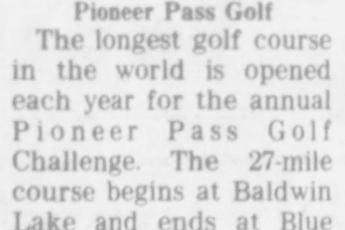 WILL BEIGN — Marsi Sipherd, right, of Twentynine Palms, will be Miss Pioneer Pass during the Pioneer Pass Golf Challenge on Oct. 1, 2 and 3 from Yucca Valley to Big Bear Lake. Darla Stephanson was runner-up. VALLEY—The terrace of the Yucca Valley Golf Club was the sight of the Pioneer Pass Camera Cavalcade Press Night Friday night in which Marsi Sipherd of Twentynine Palms was chosen to reign as Miss Pioneer Pass during the classic three-day Pioneer Pass Golf Challenge on Oct. 1, 2, 3. Recipients of the runnerup trophy was Darla Stephenson, also of Twentynine Palms. 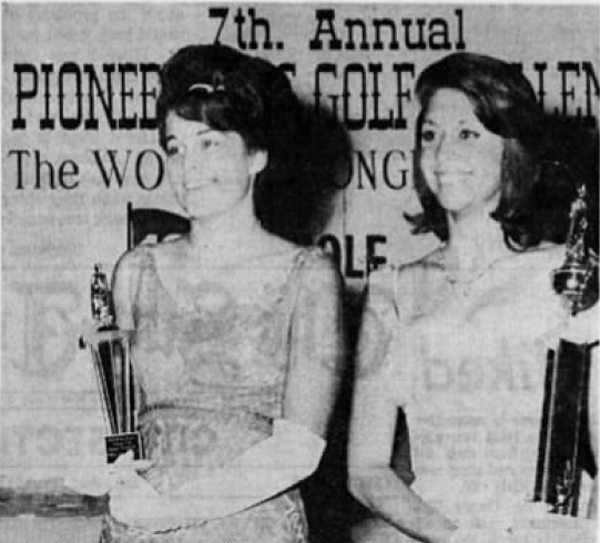 Other High Desert girls contending for the honor were Marlen (Mike) Wellman, Morongo, Valley; Dorothy Davidson, Joshua Tree; and Susan Miller and Gretchen Yaeger, Yucca Valley. Each girl received a special trophy. 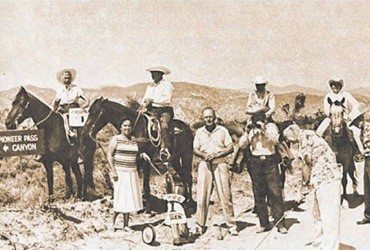 Judges were Bernie Scheppers, producer of the San Bernadino Orange Show Queen’s Pagent; Robert S. Roddick, Sun-Telegram county editor; and Donald Fell, of Pacific Palisades a public relations specialist for the Golden Empire, Pioneertown, and racing driver Dan Guerney and Carroll Shelley. The Press Night affair was co-sponsored and co-hosted by the Yucca Valley Park and Recreation District and the High – Desert Foto Camera Club. George H. Osborn was master of ceremonies and introduced Alfred M. Fisher, Arthur Chase and Milton Murry, Park Board commissioners and their respective wives; Florence Anderson, Jean Churchill, and Louise Fredericks of the High-Desert Foto Fans; and Jan Montagne, publicity director of the PPGC. The girls modeled bathing suits and formals and spoke to the audience over the microphone. Color slides of the contestants, taken during the Aug.1 Camera Cavalcade at Big Bear and Arrastre Creek, were also shown. Mrs. Anderson, who had two entries in each of the cavalcade classifications –close-up, full length and pictorial—won the photographic award and trophy. The audience was also treated to a showing of “The 19th Hole,” a Travel – World production film which depicted the triumph, trials, and tribulations of the challenge’s last four years. 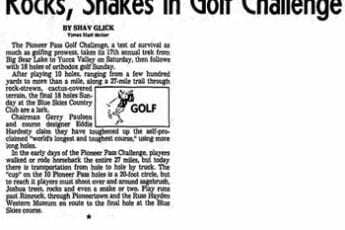 Shown along the 28-mile “World’s Longest and Only (Playable) Nineteenth Hole” were seen of the intrepid golfers blasting their way over the rugged desert hills and pine-covered mountains of the Rose Mine section and Baldwin Lake and last year’s first hole-in-one at Arrastre Creek by Raymond Nelson of Redondo Beach.